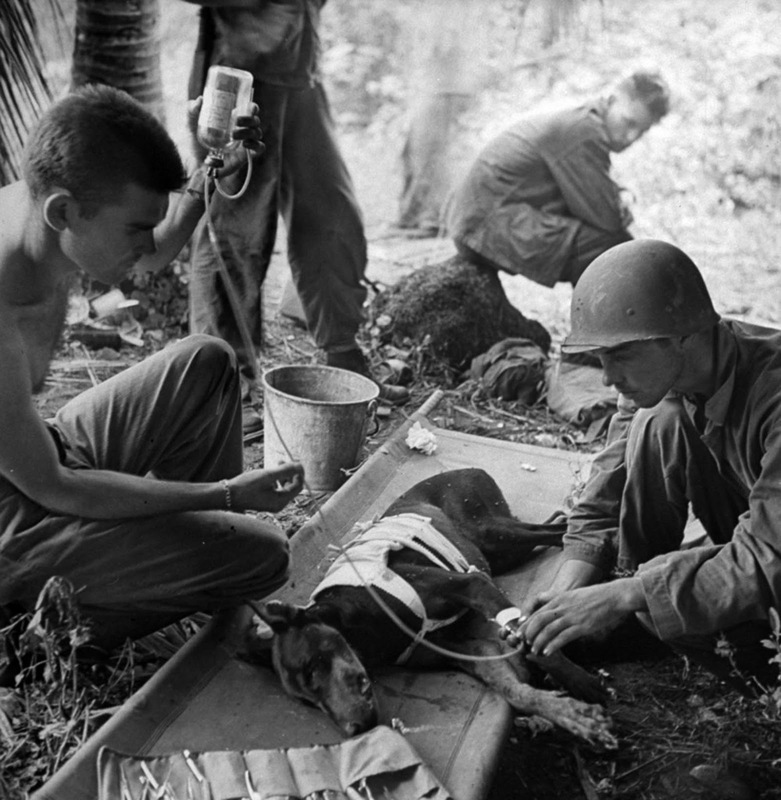 American troops treat a wounded dog on Orote Pennisula, Guam, 1944. In the late summer of 1942, the Marine Corps decided to experiment with the use of dogs in war, which may have been a new departure for the Corps, but not a new idea in warfare. Since ancient times, dogs have served fighting men in various ways. The Romans, for instance, used heavy mastiffs with armored collars to attack the legs of their enemies, thus forcing them to lower their shields. On Guam, First Lieutenant William R. Putney commanded the 1st Dog Platoon and was the veterinarian for all war dogs on Guam. First Lieutenant William T. Taylor commanded the 2d Platoon. Both landed on the Asan-Adelup beach on Guam, while the 1st Platoon under Gunnery Sergeant L. C. Christmore landed with the 1st Provisional Brigade at Agat. Man and dog searched out the enemy, awaited his coming, and caught him by surprise around the Marine perimeter or while on patrol. In addition, they found snipers, routed stragglers, searched out caves and pillboxes, ran messages, and protected the Marines’ foxholes as they would private homes. The dogs ate, slept, walked, and otherwise lived with their masters. The presence of dogs on the line could promise the Marines there a night’s sleep, for they alerted their handlers when the enemy came near. Overall, some 350 war dogs served in the Guam operation. Early on in the Guam operations, some dogs were wounded or killed by machine gun and rifle fire, and incoming mortars were as devastating to the dogs as they were to the Marines. When the dogs were wounded, the Marines made a point of getting them to the rear, to the veterinarian, as quickly as possible. In the liberation of Guam, 20 dogs were wounded and 25 killed. From the end of the campaign to the end of the war in the Pacific, Guam served as a staging area for war dogs, of which 465 served in combat operations. Of the Marine Corps war dogs, 85 percent were Doberman Pinschers, and the rest mainly German Shepherds. At the end of the Pacific War, the Marine Corps had 510 war dogs. (Photo taken by W. Eugene Smith, The Time LIFE Archives). Fascinating story - I had no idea that the Marine Corps used dogs during the Pacific campaign.